Featuring live demonstrations throughout the evening by 20 DANM artists, the event will showcase a wide variety of research and innovative technological developments—ranging from mobile technology, interactive design, and animation, to performance, video mixing, audio installation, and web based applications. 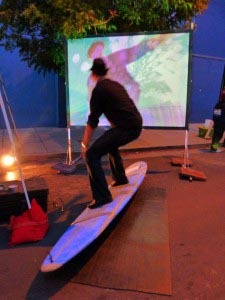 The projects include Data Surf—an interactive surfboard interface that rewards participants with their own mirrored image in a mix of colorful swirling visuals when they achieve balance and equilibrium on the surfboard. Another student will perform with his VJacket—a wearable jacket with built-in touch sensors that produce live video effects. The Sad Song Project invites participants to share their sad songs through a video and social networking piece that seeks to help the community release its emotions through song. And artwork from the Museum of Art & History’s collection will be reinterpreted through a Drawing Machine created by two alumni of the DANM program. The idea for the show evolved through discussions between Drew Detweiler—a recent UCSC graduate—and Nina Simon, the new Executive Director of the museum. Detweiler met Simon while exhibiting work with fellow DANM alum Lyes Belhocine at the Cruzio First Friday grand opening. “Sometimes we feel a bit isolated from the city up here on the hill, so this seemed like a great way to share our work with the larger Santa Cruz community,” said Detweiler. 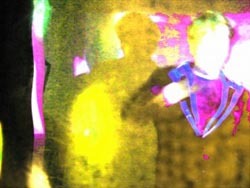 “I have always been delighted by the willingness of people in Santa Cruz to interact with digital art,” he added. “We learn so much by observing how people interact with our work, so this type of community engagement is essential for our development as artists." Detweiler noted that he and Belhocine have been exhibiting their work extensively throughout the Bay Area since they both graduated from UCSC in 2010. 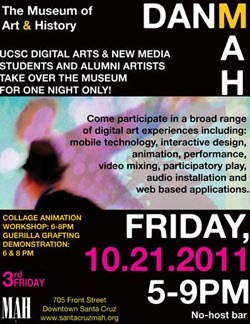 The UCSC show is part of the “3rd Friday at MAH” series. It takes place on Friday, October 21, from 5 to 9 p.m. Admission is $5 general, $3 for Students. Participating artists will include: Lyes Belhocine, Lea Cox, Daniel Christopher, Drew Detweiler, Miki Foster, Tyler Freeman, Jesse Fulton, Levi Goldman, Jessica Faith Hayden, Margaretha Haughwout, Lindsay Kelley, Nick Lally, Natalie McKeever, Kyle Forrest McKinley, Nada Miljkovic, Chris Molla, Helen Hyun-Kyung Park, Andrew Pascoe, Dustin Raphael and Jolie Ruelle. For more information, go to the DANM web site or contact the Museum of Art & History (705 Front Street, Santa Cruz) at (831) 429-1964.